On 11 and 12 July 2017, the 6th Peer-Learning Session of the Mediterranean City-to-City Migration project (MC2CM) took place in Turin (Italy) on the subject of “Promoting Equality and Socio-educational Inclusion of Migrants: Towards the construction of an educating city” . The objective of the meeting, which was organized with the support of the International Association of Educating Cities and hosted by the Metropolitan City of Turin, was to increase participating cities’ capacities and knowledge of existing tools and methodologies aimed at expanding the role and policy action of cities in the area of education.. It should be noted that the concept of education used as a reference framework for the meeting extended beyond the traditional idea of education. Understood in a broad sense, education does not only refer to the work of traditional education institutions (schools) or the family’s role as a channel through which values are transmitted. Cities also play a key role in education, not only by fostering knowledge transfer through policies, education services and centres, but also by teaching values and behaviours, becoming educators themselves. Through specific policy intervention, the creation of certain services and the shaping of a particular urban form, local governments can make a very effective contribution to developing their inhabitants' potential, promoting civic and democratic values, and promoting the coexistence of the different communities in the territory in a context of respect for diversity. Although not all local governments in the Mediterranean context have competence for formal education (schools) policies, there is a wide range of opportunities in the area of non-formal and informal education within the scope of local authorities’ powers. Based on these ideas, the 6th Peer-Learning Session of the MC2CM project explored, from different angles, the role that local administrations play in promoting equality and the socio-educational inclusion of the population, including migrants. Education policies themselves: nursery schools, educational leisure services, lifelong learning, adult education, continuing training for workers or language education, etc. The educational dimension of sectoral policies: A broad range of local policies (including urban planning, culture, sport, environment, health, local economy, sustainability, mobility or urban safety) have an educational component, as they help to influence people’s behaviour and the transmission of values. Promotion of interculturality and coexistence: policies to promote dialogue and coexistence among communities, policies for the reception and social inclusion of new arrivals, mediation services, intercultural education and cultural policies to enhance diversity and equality, among other means. Encouraging the participation of the city: policies, institutional structures and procedures to enable citizen participation and multi-sector governance, education for active and democratic citizens, promotion of ethical and civic values, promotion of civil society associations and organizations, transparency and accountability of local governments, of third-sector actors and participatory mechanisms, among other means. The cities of Amman (Jordan), Chyah (Lebanon), Lyon (France), Madrid (Spain), Tangier (Morocco), Turin (Italy) and Vienna (Austria) presented case studies, which illustrated some of the main conclusions from the group discussions among city representatives on the action areas listed above. 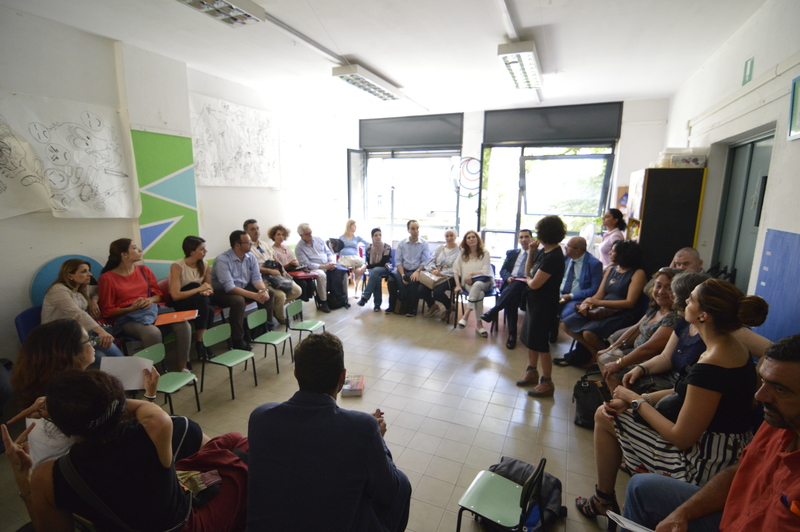 The field visit was another highlight, as it provided an opportunity to explore several initiatives of the city of Turin (or initiatives that it supports) in the neighbourhood of San Salvario. In particular, cities were able to find out about the intercultural experience of the BAY School, the work of the ASAI Association with migrant and national teenagers, and the operation of the “Casa del Quatiere”(Neighbourhood house) as a meeting place for dialogue and coexistence among the neighbourhood’s diverse communities. Internal and international migration flows in the Greater Mediterranean region have a direct and lasting impact in cities, since they are frequently the destination of the migrant population. In order to optimize the social and economic potential of migrants, local governments need capacities in the field of migration governance, particularly in terms of providing access to rights and services. In this context, the MC2CM Project seeks to contribute to improving the governance of migration at local level in cities in Europe and the Southern Mediterranean. The initiative is led by the International Centre for Migration Policy Development (ICMPD), in partnership with United Cities and Local Governments (UCLG) and the UN Human Settlements Programme (UN HABITAT). The project is also supported by the Office of the UN High Commissioner for Refugees (UNHCR). The cities participating are: Amman, Beirut, Lisbon, Lyon, Madrid, Tangier, Tunis, Turin and Vienna.